Mocha Brown Life Size Giant Teddy Bear Cuddles – Choose Your Size! When you give a gift to someone special, you want to make sure it's memorable and meaningful. What could be better than a giant teddy bear full of cuddly softness to show you care? A bear with a custom photo t-shirt of course! 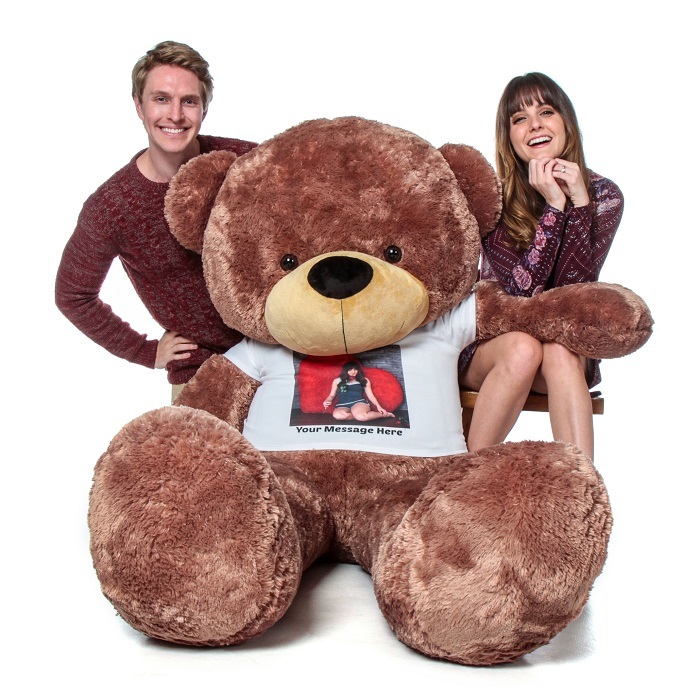 Spread love and happiness with those in your life with our life size teddy bear in a range of size with your choice of uploaded photo for an extra special touch. With choices of sizes including 2 foot or 4-foot options ideal for smaller gifts or children, as well as our life-size 5 foot or 6-foot options, you can find the perfect sized bear for this special gift. An extremely soft and huggable giant plush bear with a heavenly plush coat, this sweet bear is ready for a big bear hug and to bring a smile to someone’s face with just one look. Our bears are made with a focus on softness throughout and it shows with every touch. Our bear's chubby nose is made of smooth velveteen fabric which is divinely soothing to the touch. The fur is always soft to the touch and the bear is perfectly stuffed for a soft hug anyone will enjoy. This precious, well-proportioned life size teddy bear is stuffed with love in the U.S.A. for a gift you can give with confidence. With the ability to upload a specialized photo and customizable text of up to 5 words underneath the picture, you can create a truly unique gift sure to brighten someone’s day. Order now and give this special gift to a loved one today! Top of the Line Quality Premium Long Fur that is super snugly soft! Fully Stuffed with never recycled new Clump Resistant Stuffing making for the Best HUGS! Shirts are white and removable. Upload your photo as a JPEG, PNG, or PDF. Please note: We will print your t-shirt exactly how we receive it. We’ll print up to 5 words on the shirt under the design. Personalized photo t-shirts may require up to 2 days of processing time. Giant Teddy will not print or process orders with any inappropriate material such as text or images for privacy reason. Each Giant Teddy bear is made of high quality plush fabric and passes all U.S. safety standards. Every Giant Teddy bear is guaranteed for 6 months, from the purchase date, against defects in material and workmanship. I purchased the 5ft teddy bear with the custom photo and it was sooooooo PERFECT!! My girlfriend loved everything! Definitely worth it! A good quality product, without the support. They specifically ask if you want the product to arrive on Valentine’s (which I realize is a busy shipping day). I check the box and pay the extra money. The bear showed up two days early and naturally my girl finds it, thus ruining the surprise. And when I ask “why,” they merely shifted the blame to the shipping company and left it at that. Where is the care and concern? Isn’t that what Teddy Bears are about after all? A little effort on their part may have resulted in return business, but now I will be taking it elsewhere. I suggest you do the same.